ISTANBUL - With his blond hair, blue eyes, and romantic gestures, Turkish actor Kivanc Tatlitug has captured the hearts of women across the Arab world, his fame creating a wave of regional interest in his homeland. 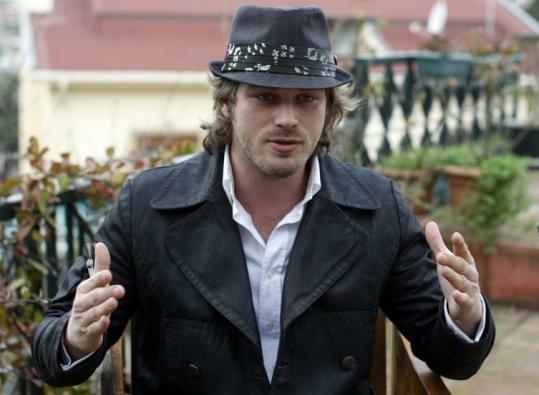 Dubbed "the Middle East's Brad Pitt" by Turkey's media, he has led the growing success of Turkish TV dramas across the region through his soap opera "Noor" and given a boost to his country's tourism industry in the process. Tatlitug attracts acclaim on promotional visits to Arab countries. "There are people who cry with joy. Age is not important," said the 25-year-old, a former basketball player and male model who won the Best Model of the World contest in 2002. The surge in the Arab world's interest in Turkish popular culture reflects cultural and religious similarities between the Arabs and their northern neighbor, a predominantly Muslim but secular country that is trying to join the European Union. It also comes as Barack Obama plans to make Turkey the first Muslim country he visits as US president to emphasize that "democracy and modernity and Islam can all coexist," his secretary of state, Hillary Clinton, said in Ankara recently. The series "Noor," aired by Saudi-owned MBC satellite television, focuses on the relationship between Mehmet - whose name in the Arabic version is Mohannad (not Mohammad) - and his wife Noor. Its final episode attracted nearly 85 million viewers across the Arab world, a record for Arab TV. "Mehmet is blond and has blue eyes, yet I am a Muslim and we have a culture which is very close to that of the Middle East," Tatlitug explained in an interview. "People felt a contrast between the outer appearance and the behavior," said the actor, son of a patisserie owner from the Mediterranean city of Adana. "He is not somebody who goes out and indulges in roguish behavior. He is a man who shows great respect, interest, and love for his wife." Tatlitug is building on the success of "Noor" in the Arab world with a new series, "Mirna wa Khalil," in which he also plays the romantic lead, Halil. "Noor" has also courted controversy. Prominent Saudi cleric Sheikh Saleh al-Luhaidan denounced the series as evil, saying it was permissible to kill satellite TV executives for broadcasting "indecent material." But the fatwa has not dented the series' popularity. "Noor" is one of about a dozen Turkish TV series featured on Arab TV. Interest in the soaps has fueled a surge in visits to Turkey by Arab tourists. The number of Middle Eastern and North African visitors jumped 50 percent in two years to nearly 2 million in 2008. Turkish consumer-electronics maker Vestel is looking to cash in on the growing interest in Turkish soaps. This month it will hold a party for 100 contest winners who will get to meet Tatlitug.